Deep vein thrombosis (typically shortened to DVT) is a condition where a clot has formed deep within the veins of the calf most commonly. It affects hundreds of thousands of people annually. Sometimes it is caused by injury or immobility while other times blood clots in legs can be caused by hormone medications(which is particularly found even more so in smokers). Deep vein thrombosis can also be a result of genetically inherited traits and the risk of developing it increases with age. There are serious risks associated with DVT including the movement of the clot to the heart or the brain which can result in a stroke or heart attack. 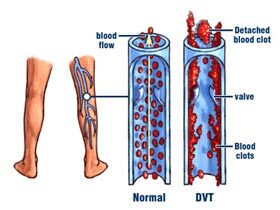 Blood clot symptoms associated with DVT can be rather vague. Redness may appear on the affected leg or other noticeable changes in skin color may be present. A sensation of warmth may also be present with blood clots in legs, specifically in the area where the DVT has occurred. Pain may also be present, and this can be exacerbated by the full weight of the body being put on the affected leg. A sensation of tenderness may be felt in the leg where the clot has occurred when it is touched or otherwise stimulated. And, swelling can also be encountered when a clot has occurred as well, and this is known as edema. Thrombophlebitis can also occur when a clot has formed in the leg. This condition refers to the swelling of the vein that the clot is in. Veins affected by thrombophlebitis are superficial and visible because they exist on the surface of the skin. When the affected veins lie deeper within the leg, the condition is known as a DVT. Although it may seem as though thrombophlebitis is less severe than deep vein thrombosis, both cases of blood clots in legs can lead to serious health complications and require immediate medical care. The symptoms of thrombophlebitis are similar to those with DVT. Treatment of blood clots in legs most always involves a trip to the hospital. In almost all cases, there is nothing that can be done about the existing clot, although a small few with exceptionally large clots may need surgery for their removal. Typically, blood clot treatment involves the intravenous administration of medications like heparin which are used to thin the blood and help prevent the formation of future clots. Most people begin an oral regimen of a medication on a prescription such as Coumadin at the conclusion of their hospital stay. Blood clots in legs are typically resolved by the body on their own over time, although the inclusion of the medicine following the stay is used for the purpose of preventing recurrent clots. There are no natural treatment options for an existing blood clot. However, there are a numerous amount of natural choices to consider in order to prevent their future return. There are many foods that are eaten every day that are considered natural blood thinners. Grapes and pomegranates for instance, are thought to potentially be effective at reducing the risk of forming blood clots. And, there are also herbal options to consider too. Thanks to salicylates, which are effective at counteracting the coagulating effects of vitamin K within the body, certain herbs like ginger and garlic can act as potent blood thinners. However, it is incredibly important to remember that natural blood thinners should never be used medicinally in conjunction with medications designed for the same purpose. This can thin the blood entirely too much and lead to adverse complications. Aside from medical and alternative healing options, it is also important to consider lifestyle changes to further reduce the risk of blood clots in legs and other areas of the body. Smoking is a major risk factor, and it should be immediately ceased as soon as possible for a multitude of reasons including its effect on blood. And, losing weight can also help contribute to a lower risk of blood clots as well. Since immobility is one of the most common blood clot causes, it is important to move around as much as possible, even if it means just changing positions regularly. These lifestyle factors that are also major blood clot causes provide many healthful benefits and can lead to overall better health. It is very important that if any symptoms of blood clots are present that immediate medical care be sought. Delay can lead to an increased risk of serious complications. And, while there are many natural and alternative options to help reduce the risk of blood clots in legs and other parts of the body, they are not suitable for treatment of same and should only be utilized under the care of a medical provider. A blood clot in arm areas or in the legs can be life threatening in some individuals and should be considered a cause for immediate medical intervention.